The table makeover I did for my sweet cousin. My tag sale chest makeover in AS Aubusson blue. This next table had a few different looks. After, using AS Old White. After after, adding AS Coco and a heavy distressing. Painting it black really made it pop in this space. Sometimes it's the little changes that I love the best! A little change that I'm so happy I made was repainting this frame on my mantel. When I look back at this one, I think to myself what was I thinking!?! Annie Sloan to the rescue! So much better!! The last piece I did this year is one of my favorites!! My Craigslist desk makeover. This was also my first time trying Miss Mustard Seeds milk paint. I used Luckeets Green. Well that wraps up my 2012 year in review favorite paint projects! Thanks so much for stopping by and taking a look! ...wishing you all a very Merry Christmas!! I can't believe Christmas is just a few days away, I still have so much to do!! I haven't even begun to start my baking, I better get movin! For my centerpiece I simply used some greens and a red poinsettia and placed them in this antique pot that I've had for years. The plaid placemats I just picked up in HomeGoods. Added some greenery and ribbon to the light fixture for a festive touch. Thanks so much for stopping by! I know you all must be super busy too! Are you all ready for Christmas?!? I missed you guys!! We had guests staying with us the last few days, my cousins from Canada. We had such a nice visit. I always put a little tree in our living room, on this table. This year I went with a real one that I found at the supermarket for $20. I found this little needlepoint pillow last year at a local antique shop. Fridays tragedy hit so close to home. We're only 30 mins. from Newtown, Connecticut. I can't stop thinking about all the families that lost loved ones and those little angels that were taken from this world way too soon! My son's teacher lost her sister-in-law that day, she was one of the teachers at Sandy Hook Elementary. She was married and a mother of four. Please continue to keep these families in your prayers, they need our prayers more then ever! After leaving the vet's office on Thursday I came home and found a little surprise waiting for me. This sweet stocking made by Linda over at White Weathered Hutch with a little note wishing me a Merry Christmas! Isn't it so cute, it smells good too! Linda added cinnamon potpourri inside it. I knew right away where I was placing it! Having started this blog has introduced me to so many new and wonderful friends, that I am so thankful for! Thank you Linda for this sweet surprise, I love it!! 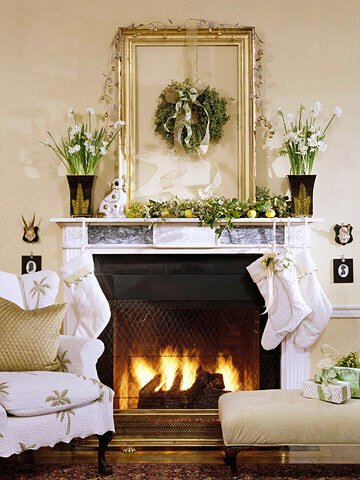 I'm joining Debbie's Holiday Knockoff Decor Party today. I'm sharing where I got the inspiration to do this years Christmas mantel. Here's the image I found over at BHG, I loved this look! In mine I used a real wreath and I wanted to add a few pops of red. Thanks so much for stopping by and have a super week! I went with a whole new look on the mantel this year. 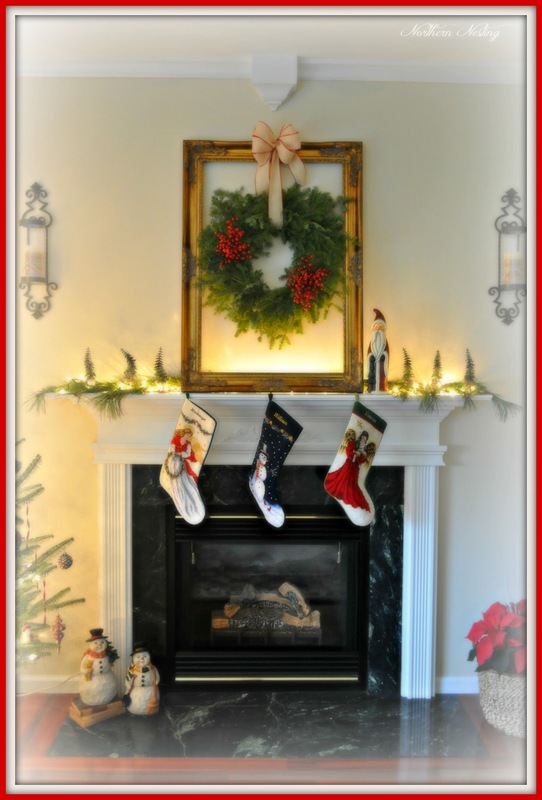 I usually always put my Santa painting which you can see here on the mantel. I bought the frame in Hobby Lobby a few weeks ago when they were on sale for 50% off and tied a real wreath to it, my mom made the bow for me. I also poked two berry picks in there for a pop of red. The ribbon I bought in AC Moore craft store. Added an old fashion Santa that I had for years, along with real garland and a few faux Christmas trees. This is the first year we've had a real tree in here, I love it! Think we just started a new tradition! It's an 8ft. fraser fir. A little peek looking in from the breakfast area. I'm so happy with the way this room turned out! Thanks so much for stopping by! Thank You for the thought! New Hobby " Gypsy in ME"
Are you a busy mom?